What a rich and inspiring time we had in Tiree. Over the three days, thirty-two islanders representing twenty different islands came together to learn from each other and debate a wide range of topics including the Islands (Scotland) Act, Crown Estate, Brexit, Housing, Social Care, Marine Plastic, Tourism, Energy, Population & Demographics as well as a strategy session for S.I.F. A very productive few days despite Storm Ali – and we would like to thank everyone that was able to attend, contribute and help out. We would also like to thank the Community Learning Exchange which made it possible for many of us to be there along with our funding contribution from the Scottish Government. Catch up with news from S.I.F and the islands in our latest member bulletin- download here. In a great piece of news, a recent study of young people on the islands that stretch from Eriskay to Berneray has shown that, against the trend of many areas, young islanders are staying on the islands and returning home. Are you seeing a similar trend on your island or is it going the opposite way – let us know. March 2018 saw the conclusion of the ESIN water study involving 8 small European islands in Greece, Croatia, Ireland and France which all had issues with water shortage. ESIN received a prize for its research on four areas of water saving actions (training, engineering, billing and switching off) at the Greening the Islands Conference held in Savignana, Sicily, last September and will be presenting an overview of the project at the 2nd Smart Islands Global Gathering in Calvia this April. One of the most interesting examples of water saving was provided by 2 islands in Croatia’s Dalmatian coast, Vis and Lastovo. 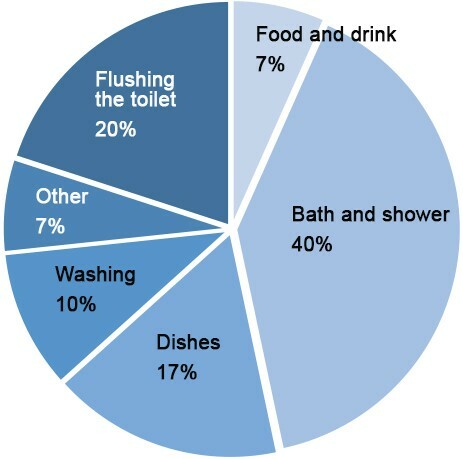 The diagram below represents their average water consumption of 120 litres per day split in different uses: the darker the colour, the less purified the water needs to be. By way of comparison, the average daily water consumption rate per capita in Europe varies between 40 and 150 litres per day. To encourage water saving in particular through water flow reducers (from 12 to 6 litres per minute), Sunce, a local sustainable development agency, developed “EkoPartner,” an eco-certification program for environmentally-responsible private tourist accommodations. The EkoPartner certification included 3 mandatory eco criteria, water saving, waste recycling (at least one type of waste) and energy efficiency (LED lights), with a further 7 criteria: washing & cleaning with eco products, green transport, local community involvement, organic and local food, noise & light pollution, traditional architecture, knowledge improvement. 10 small tourist accommodation providers on Lastovo and 5 on Vis were certified: a good start but not enough to make a real impact. 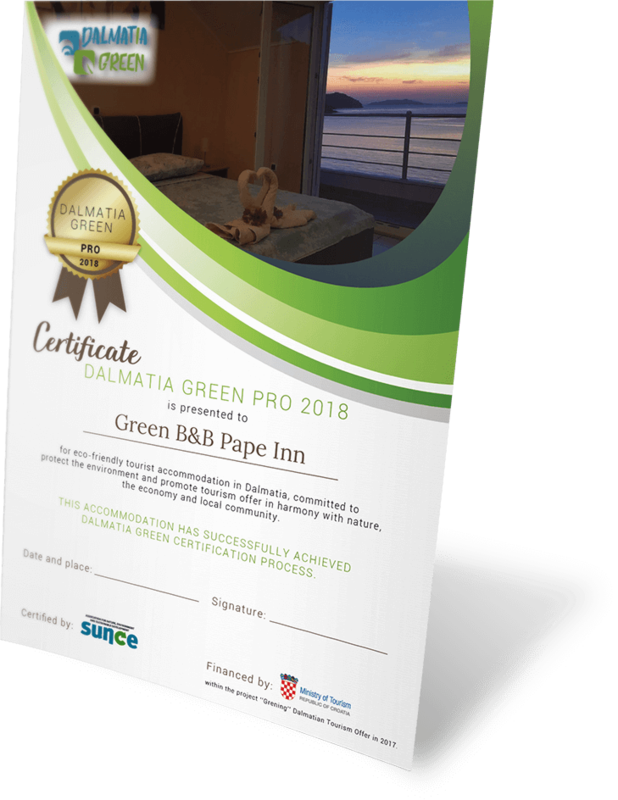 To build on this, Sunce started a new innovative eco-certification program called Dalmatia Green last July as part of a Greening of Dalmatia Tourism Offer project. To prove that going ‘green’ and saving water really pays off, the program provides several discounts to tourist accommodations from green industry companies to enable an easier step into eco-friendly practices. Dalmatia Green then differentiates eco-friendly accommodations and lists them on Ecobnb.com – an international platform for booking of sustainable accommodations. The program also has an educational dimension in that guests are provided with tips on how to be a sustainable tourist and use water wisely! ‘In Spring 2013, following the announcement that there would be a Scottish Independence Referendum, Scotland’s three island authorities – Orkney, Shetland and Comhairle nan Eilean Siar – formed a joint constitutional working group. This culminated in the launch of the Our Islands Our Future campaign in June 2013, and subsequent commitments from both the Scottish and UK Governments to better support and empower Scotland’s island communities’ – Islands (Scotland) Bill Executive Summary. • National Islands Plan to set out government strategy for improving outcomes for island communities. • Duties placed on Scottish Ministers and public bodies to have due regard to island communities – this will include carrying out island impact assessments. • Protecting the parliamentary constituency boundary of Na h-Eileanan an Iar. • Exceptions to the rules around three or four-member wards. • Licensing scheme for works in or under the sea in the coastal waters around islands up to 12 nautical miles. Read the full summary and timeline here. Stage 1: parliament considers the main principles behind the bill, what it is trying to do and how it will do it. Public consultation is carried out and evidence collected. The Rural Economy & Connectivity Committee was appointed as the lead committee to scrutinise the Islands Bill and Stage 1 was completed on 8 February 2018. Stage 3: this will involve the final considerations and is the last opportunity for MSP’s to lodge amendments. Amendments will be considered followed by Decision Time on whether the Bill should be passed. After that: once passed, a final version of the Bill will be published and there will be a four-week period when it can be challenged. After this the Presiding Officer will submit the Bill to The Queen for Royal Assent. It will then become an Act of the Scottish Parliament and part of the law of Scotland. “We want to see more households living in well insulated warm homes; accessing affordable, low carbon energy; and having an increased understanding of how to best use energy efficiency in their homes” – Angela Constance, Cabinet Secretary for Communities, Social Security and Equalities. In its ambition to eradicate fuel poverty, the Scottish Government is bringing forward a new Fuel Poverty Strategy and a Warm Homes Bill. People in island and rural communities are living with the highest levels of fuel poverty and acute fuel poverty in Scotland and the opportunity to contribute an island perspective to the consultation was very welcome. However, while we were pleased to see a recognition within the consultation of the distinct and additional challenges for island communities, we were disappointed that this did not translate into proposals for distinct and tailored action on the ground or embrace the enormous opportunity islands hold for sustainable energy. In fact we are concerned that the proposal as it stands may have an unintended detrimental impact on island and rural communities. You can read our submission to the consultation here. Following on from the Smart Islands Initiative, spearheaded by island local and regional authorities of the Members States signing the Smart Islands Declaration, momentum has been building up for national and European support for islands in Europe. In the frame of the informal meeting of Energy ministers that took place in Valetta under the 2017 Maltese Presidency of the Council of the EU, Ministers of 14 Members States including from Greece, Malta, Cyprus, Italy, Croatia, Germany, France, Denmark, Sweden, Ireland, Spain, Portugal, Finland and Estonia signed together with the European Commission a political declaration to launch the new “Clean Energy for EU Islands” initiative. Unfortunately the UK was not represented, although Scotland is very much at the forefront of the Renewable Energy revolution. However these policies have the support of the Scottish Government, and Scotland through S.I.F. and the Islands Councils in the CPMR are actively representing local and regional stakeholders. Clean Energy for EU Islands” initiative. To start the transition process in the EU, the Initiative aims at first accelerating the clean energy transition on EU islands, by helping them reduce their dependency on energy imports through enhanced exploitation of their own renewable energy sources and uptake of more modern and innovative energy systems. Members States expressed their full support to the Initiative as a stable, long-term framework that will help support replicable and scalable projects through the provision of financing and technical capacity for islands. The island of Crete hosted the Inaugural Forum on the “Clean Energy for All European Islands” initiative, part of the Winter Package, that was tabled by the European Commission last November under the title “Clean Energy for All Europeans”. The Forum was organized by the European Commission and the Greek government with over 200 participants and close to 40 speakers taking the floor, representing an overwhelming endorsement by political representatives of national, regional and local level as well as industry and civil society stakeholders. 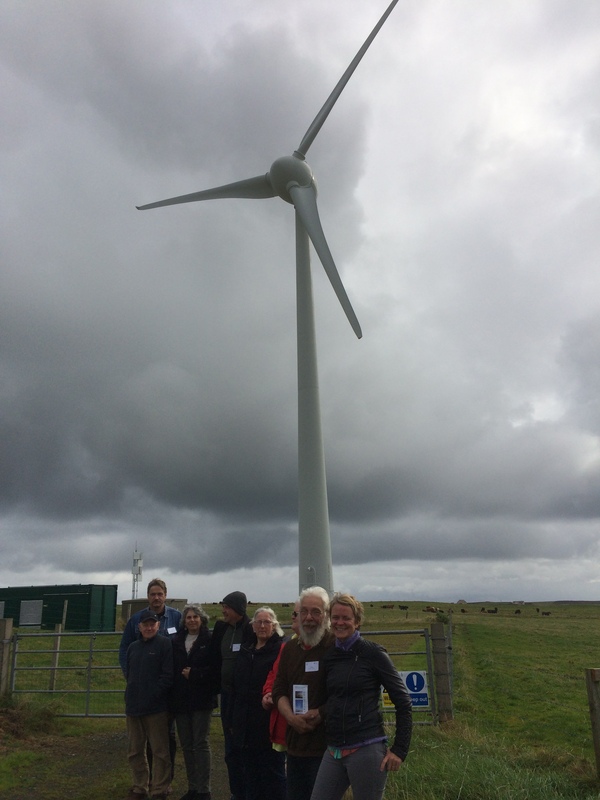 Community Energy Scotland was invited to present the access project in Mull and other pioneering Scottish projects. The EU commission has an ambitious objective: 1000 EU islands decarbonised by 2030! The call for a Clean Energy EU island secretariat is a first step to ensure that islands can become platforms for pilot initiatives on clean energy transition and showcase success stories of islands’ transition at international level. The next step is to set up an Island Facility under Horizon 2020 to support the comprehensive energy transition in preparatory and implementation phase. Based in Brussels but reaching out to the islands, the Secretariat’s aim is to carry out a benchmarking study on energy systems on islands and to assist the islands to design and prepare decarbonisation plans by providing dedicated capacity building, technical assistance and advisory services. It will create and manage a platform of exchange of practice for islands involved clean energy projects through a dedicated website which will also offer web-based tools to facilitate networking and exchanges. It will also organise Islands Initiative forums and islands technology fairs to bring together all interested parties including investors, to share best practice in financial and regulatory tools and promoting best available technologies, with the aim to take action on the ground. It will concentrate on identifying and executing clean energy projects that create local employment, community empowerment, as well as support growth in tourism, agriculture, fisheries and other important economic sectors on the islands through lower local energy pricesS.I.F. and ESIN are part of a bid to run the secretariat fronted by the CPMR, together with Community Energy Scotland. Their bid is the only one fronted by island organisations and is supported by the Scottish Government. The winning bid will be announced by July 2018. Catch up with news from SIF and the islands in our latest member bulletin- download here. Formally introduced on 9 June 2017, the Bill is for an Act of the Scottish Parliament to make provision for a national islands plan; to impose duties in relation to island communities on certain public authorities; to make provision about the electoral representation of island communities; and to establish a licensing scheme in respect of marine development adjacent to islands. Stage 1 of the process has included a call for evidence from the Rural Economy and Connectivity Committee. Written evidence was submitted by a range of groups and individuals including SIF and you can see our submission here – thank you to everyone that contributed. Our SIF Chair, Camille, was invited to take part in an evidence session with the Committee – you can watch it here. The Committee also went out and about around the islands to hold direct discussion with islanders and you can read the feedback here.